Philip A. Weibler, left, and Nicholas D’Amato won first prize in the “Vision from the Past” and “By the Light of Night” categories, respectively. For the 2017 John E. Gruber Creative Photography Awards Program, the judges created two categories: one to feature outstanding work made prior to the creation of Amtrak in 1971, and another to showcase recent innovations in night photography made possible by modern digital cameras and creative use of them. More than 100 photographers submitted work for consideration in the two categories, challenging the judges to select the best from a remarkable range of photography. Entrants spanned a wide range of ages, included two father-son pairs, and came from nearly thirty states and eleven different countries. 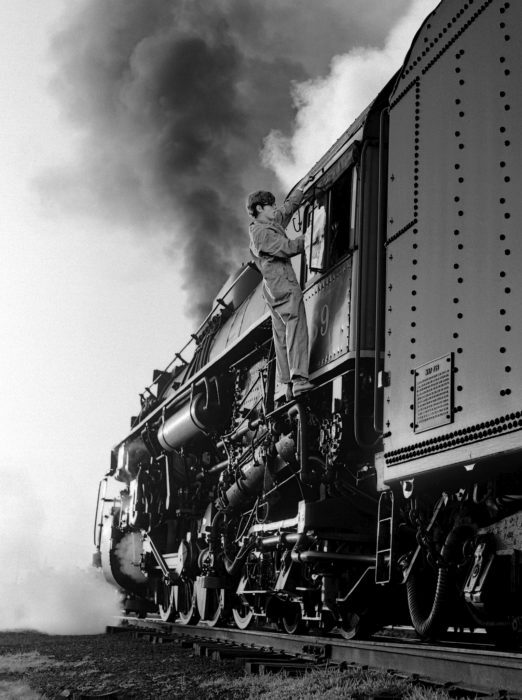 The entries to “Vision from the Past” remind us that creative railroad photography is seen not only through today’s lenses, that photographers have been creating good work for decades. Then, as now, steam attracts. Some of these photographers are well-known, some are recognized here for the first time. The judges picked three examples, from three eras: first place, Philip A. Weibler, Chicago & North Western at North Western Terminal, Chicago, 1955; second place, Herbert B. Livesey, Camelback View from Automobile, 1938; and third place, John E. Helbok, fireman cleaning window glass on Nickel Plate Road no. 759, 1970. Each, in its own way, is historically significant. They represent everyday happenings, recorded in a creative manner, showing the importance of recording what you see around you all the time. Of note, both Livesey’s and Helbok’s sons, Dennis and Oren, have placed in recent awards programs. The Judges Also Liked category features six additional views. We cannot help but wonder what other “visions from the past” are out there. This was a rich period for railfan photography and the outstanding images here represent just the tip of the photographic iceberg. 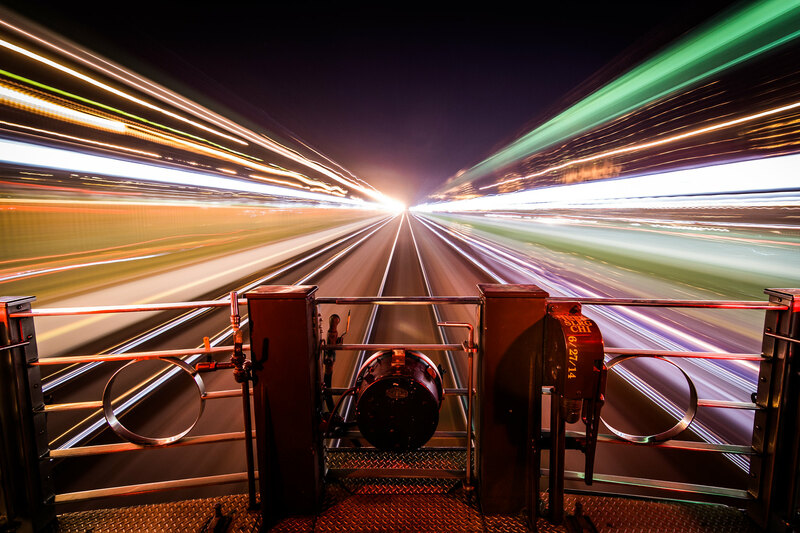 The “By the Light of Night” category brought in a flood of images capturing many aspects of contemporary railroading. While most were captured at night, many were underground or in otherwise dark places where the photographers made the most use of new technology. 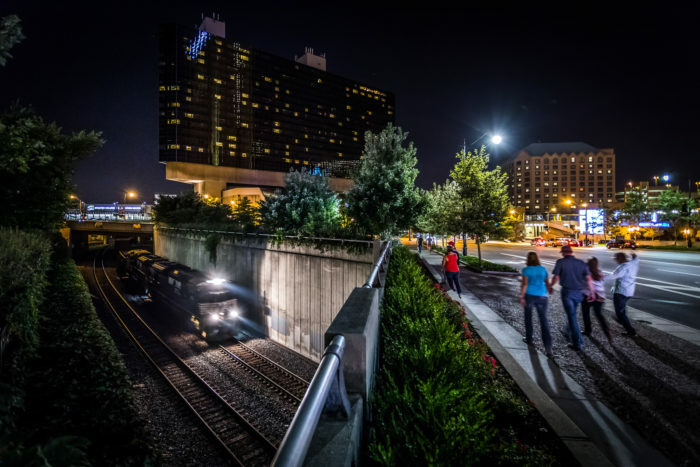 The judges looked for entrants who took full advantage of the low-light imaging capabilities of modern digital cameras to capture creative views of railroading in the dark that would have been difficult if not impossible in the film era. First prize went to Nicholas D’Amato for his fresh take on a classic spot: a starlit view of Morant’s Curve along the Canadian Pacific main line near Lake Louise, Alberta. Brandon Townley took second prize with a complex composition of everyday nightlife in Columbus, Ohio. Darryl Bond’s third-prize view portrays the drama of contemporary steam railroading in China as only the highest sensitivities of the latest digital cameras can capture it. The judges faced tough decisions to pick clear winners from so many great photographs, and they selected eight additional views that the Judges Also Liked. In each category, the first prize winners receive $500, with $250 for second prize and $100 for third. The Center will publish the winners in the Spring 2018 issue of Railroad Heritage, and Railfan & Railroad magazine will publish the winners in their April 2018 issue. We are again partnering with the California State Railroad Museum in Sacramento to present a gallery exhibition of the winners, as well as several selections from both “Judges Also Liked” categories. The first contest, “Vision from the Past,” solicits excellent photography captured any time before May 1, 1971. 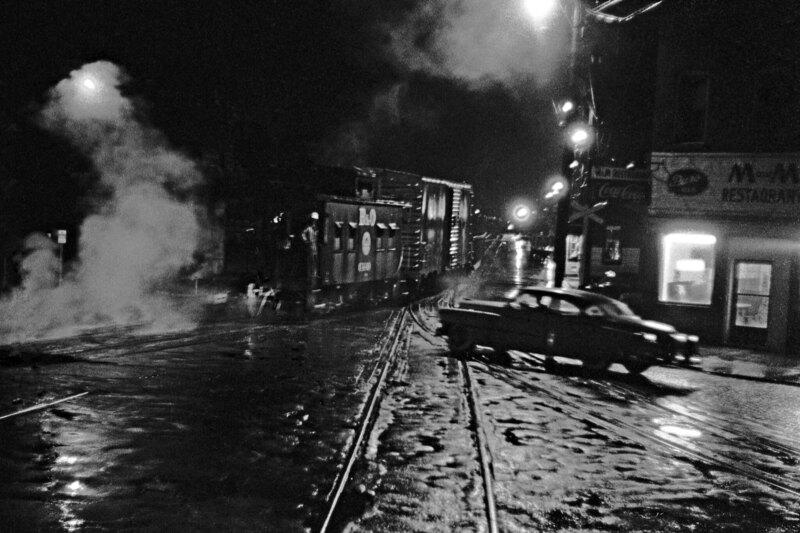 The judges were delighted with Charles McCreary’s third-place image from the 2016 “Most Evocative” contest, which depicts a Pennsylvania Railroad passenger train above a bustling street scene in Pittsburgh in 1950. 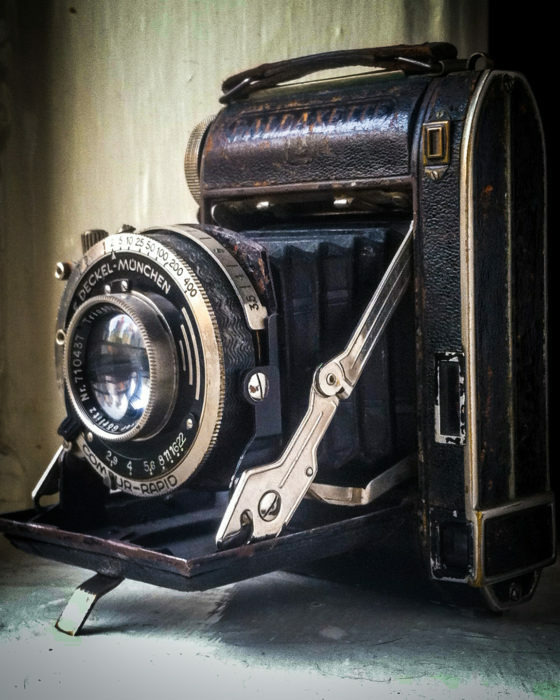 Many photography contests require submissions of work from a recent timeframe. This category of this year’s contest requires work that is not recent. The judges hope this will bring forth even more captivating, historic images of railroading and the railroad scene. As with the “Most Evocative” contest last year, the judges will evaluate images for their visual impact, but also with an eye towards the historic value of their content. The second contest, “By the Light of Night,” seeks the best in low-light photography. Our eyes work well in dim environments, so that we can observe activity illuminated by the moon or just a few dim lights. Photographing what we see in low-light conditions has traditionally been a challenge restricted by technology, be it the slow response of photographic film or “noisy,” high-ISO images from digital cameras. By necessity, photographs made in dark conditions have traditionally taken the form of long exposures. Improvements in the sensitivities of digital cameras over the past several years have opened up more creative opportunities for twilight, night, and dawn photography than were possible with film and even early digital cameras. With these advancements, today’s photographers can now make images in low-light conditions that more closely replicate what the human eye can see. 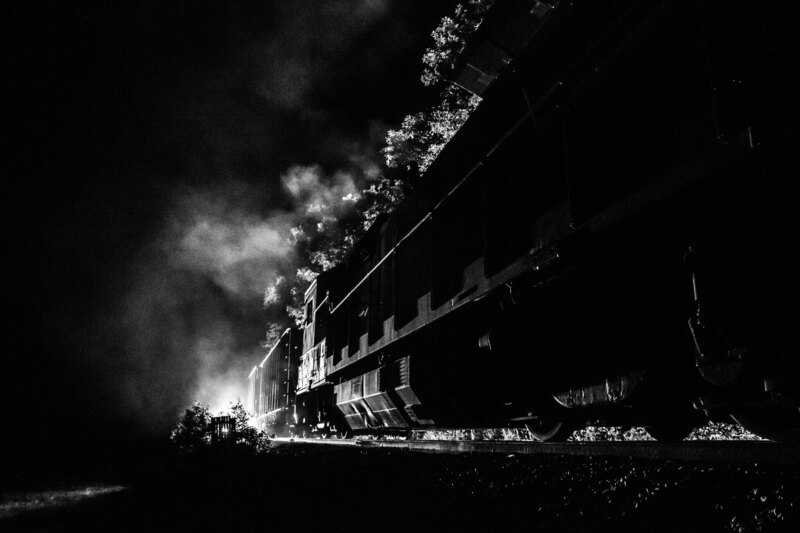 For the “By the Light of Night” contest, the judges are looking for originality, both in terms of exploring the technical capabilities of high-ISO photography, and the dark details of railroading that often go unnoticed at night. Entries may be of any ISO, and artificial lighting as well as Photoshop processing are permitted. The judges are looking for creative use of the digital capabilities to do new, innovative things. Entries must have been taken after December 31, 2013, between sunset and sunrise, underground, or in an otherwise dark environment. Chicago & North Western 4-6-2 steam locomotive no. 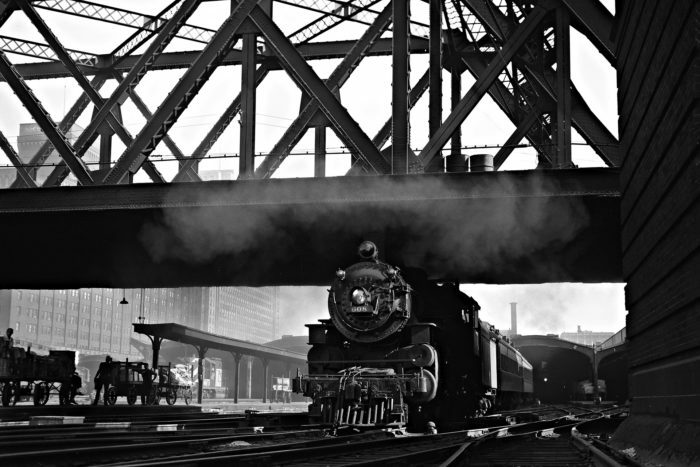 608 blasts under the Lake Street “L” departing the Chicago Passenger Terminal with a commuter train in July of 1955. Philip A. Weibler, West Chicago, Illinois, is a career railroader, having worked for the Norfolk & Western in 1956, the Rock Island from 1960 to 1972; and the Chicago & North Western from 1975 to 1999. He received a Bachelor of Fine Arts degree in industrial design from the University of Illinois. Through the years, he has presented many outstanding photographs. For this view, Weibler used a 2¼ x 3¼ “Baby Graphic” camera fitted with a 120 roll film back. The judges were drawn to the low camera angle, afternoon back lighting, and the light exhaust pouring out from under the massive steel bridge that carries both Lake Street and “L” tracks. Note the four workers at left waiting with baggage carts and what looks like mail and express, perhaps for an intercity passenger being backed in for loading. 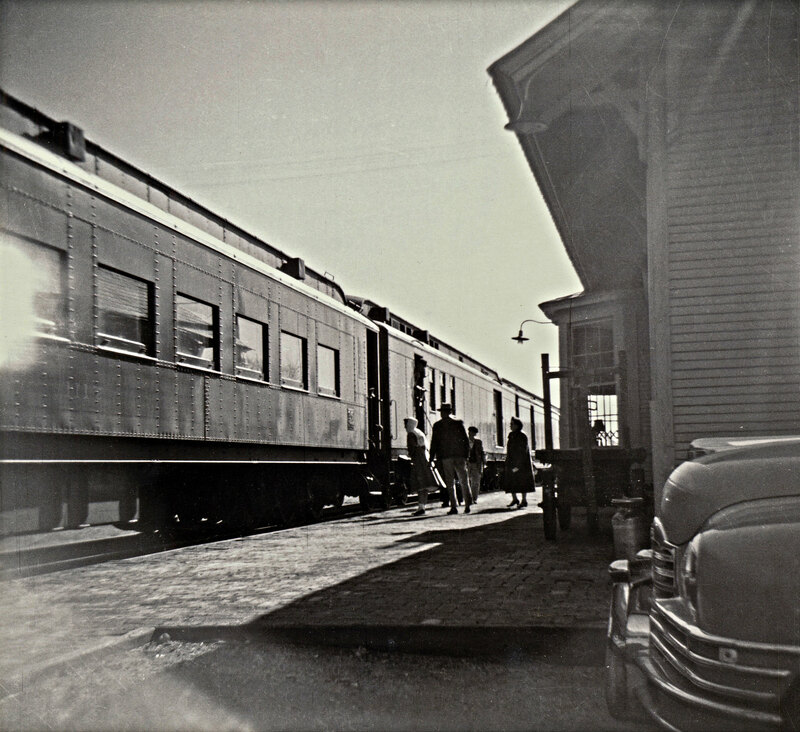 The photograph was taken in 1955, the year that CNW would receive its first bi-level gallery commuter coaches. Reading camelback steam locomotive no. 539, a 4-6-0 of the L-1-c class, leads a local train across a highway in rural Pennsylvania in the spring of 1938. The judges note that, at a time when panned shots were not popular, Herbert Livesey’s photograph shows unusual understanding of creativity and the ability to make maximum use of the tools at hand—in this case, his one-lens camera. In this era, most railroad photographers concentrated on locomotive portraits. Livesey’s Baldaxette I (1936) camera used for this photograph. 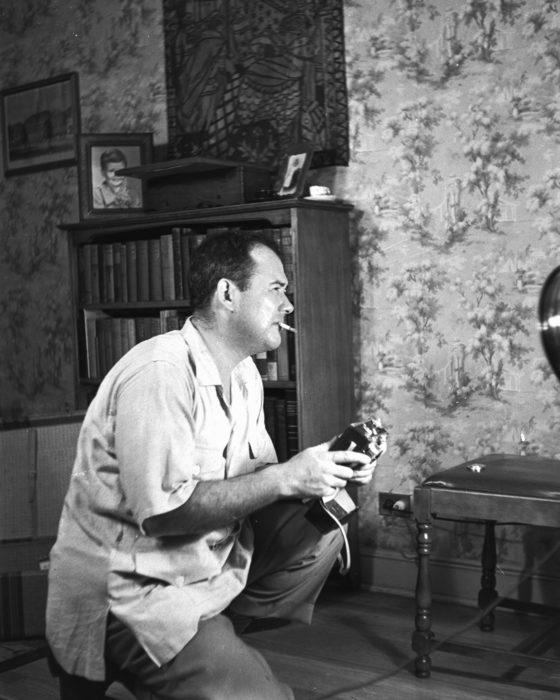 Herbert Bailey Livesey at home in 1939. John Helbok, New York City, received third place for his photograph of then-teenaged Steve Wickersham cleaning the window glass on Nickel Plate Road steam locomotive no. 759 at Elizabeth, New Jersey, on July 15, 1970. 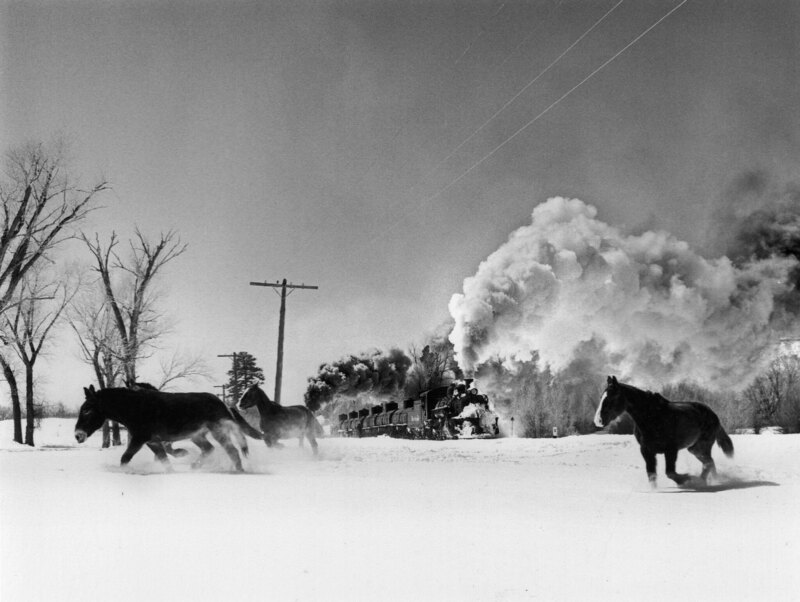 Wickersham was beginning what would become a life-long dedication to steam and railroad preservation, giving additional significance to Helbok’s wonderful photograph. The 2-8-4 locomotive would lead a trip to Jim Thorpe, Pennsylvania, and back that day over the Central Railroad of New Jersey. Helbok used a Mamiya C330 twin lens reflex camera and 120mm Kodak Plus-X 620 film. On a rainy night in Parkersburg, West Virginia, a Baltimore & Ohio eastbound freight train leaves town. 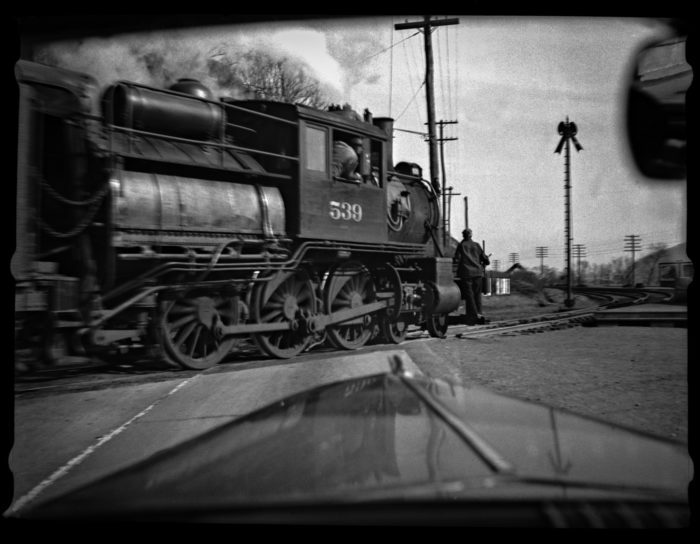 Photographer David T. Mainey was working for the railroad as a Technical Trainee at the time and used a Leica IIIC camera. Read more about the 2017 John E. Gruber Creative Photography Awards Program. 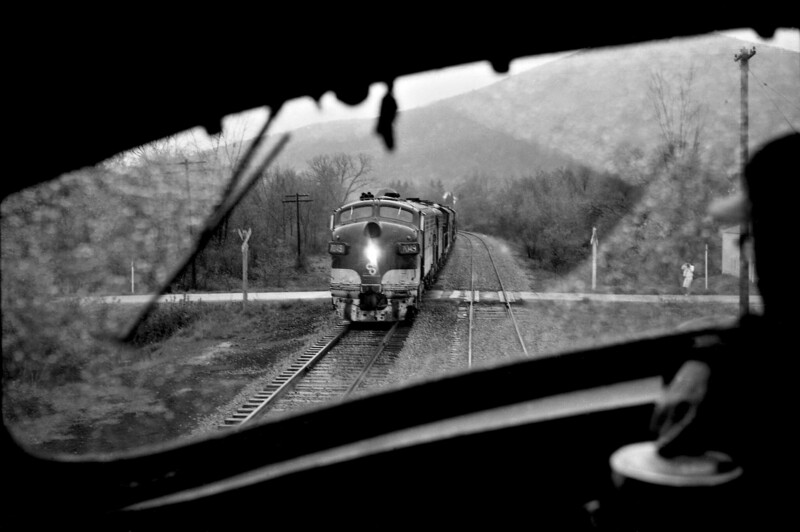 The windshield of a northbound Baltimore & Ohio freight train frames a southbound train at rural crossing just north of Bradford, Pennsylvania, on the B&O’s former Buffalo, Rochester & Pittsburg line on a rainy May 13th, 1968. The southbound is using power borrowed from the Chesapeake & Ohio, showing influence that would eventually lead to the “Chessie System” mergers. Note the photographer at far right: Ken's wife, Patricia Kraemer, photographing her husband's train. Read more about the 2017 John E. Gruber Creative Photography Awards Program. Three passengers board Santa Fe train no. 5 during a flag stop at Sedgwick, Kansas, in December of 1956. Station agent David L. Book stands behind the passengers. Photographer Gary Rich, ten years old at the time, recalls that three passengers in 1956 was a banner day at Sedgwick—one passenger per week was more common. Read more about the 2017 John E. Gruber Creative Photography Awards Program. On a snowy December day in the Bronx in 1969, a former Cleveland Union Terminal P-class electric locomotive, then working for Penn Central, waits with its train for a signal at DV Tower on the former New York Central's Electric Division. At Croton-Harmon, 23.45 miles to the north (railroad west), the train will be handed over to diesel power for the remainder of its trip to Albany, New York. 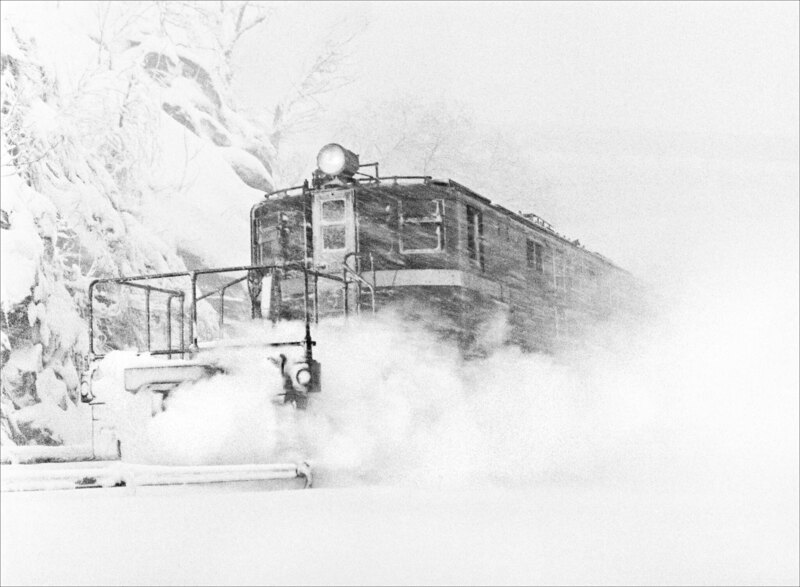 The falling snow and leaking steam from the heat line give the stopped train the impression of great speed. Photographer John Helbok used an Olympus Pen-F half-frame format camera with Kodak Tri-X 35mm film. Read more about the 2017 John E. Gruber Creative Photography Awards Program. Horses run away as a whistling Denver & Rio Grande Western narrow gauge freight train approaches. The train, led by 2-8-2 steam locomotive no. 488 (with no. 492 pushing), is leaving Chama, New Mexico, bound for Alamosa, Colorado, on March 14, 1964. Read more about the 2017 John E. Gruber Creative Photography Awards Program. 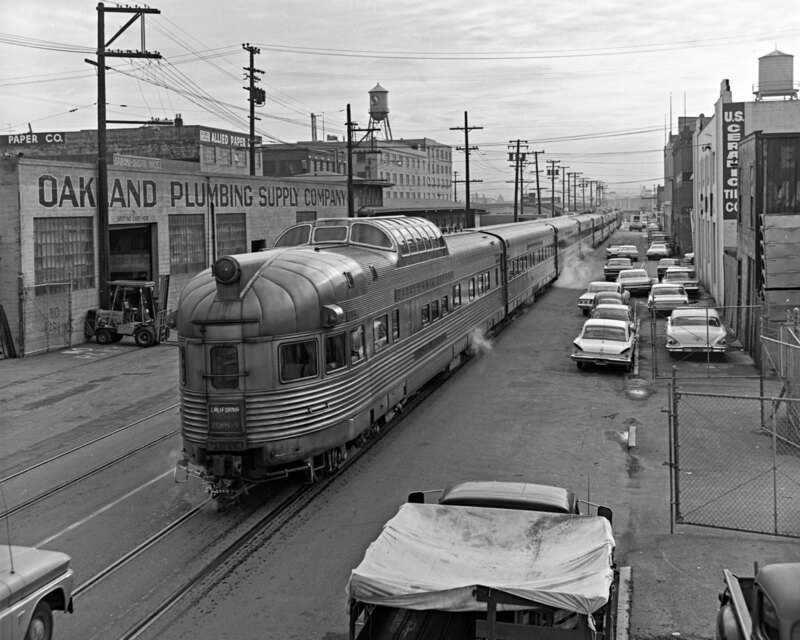 Western Pacific's California Zephyr departs Oakland, California, as it heads through a canyon of industry along 3rd Street on February 1, 1968. Observation-dome car "Silver Penthouse" brings up the rear of the eastbound Zephyr as it navigates a landscape dominated by building supply and paper warehouses under a looming "Safeway" water tower. This classic street running scene illustrates the train's use of steam heat, an abundance of "vintage" cars, and the world as we knew it before the advent of Amtrak and containerized freight. Read more about the 2017 John E. Gruber Creative Photography Awards Program. Canadian Pacific freight train traversing Morant’s Curve along the Bow River near Lake Louise, Alberta, on the night of February 11, 2015. 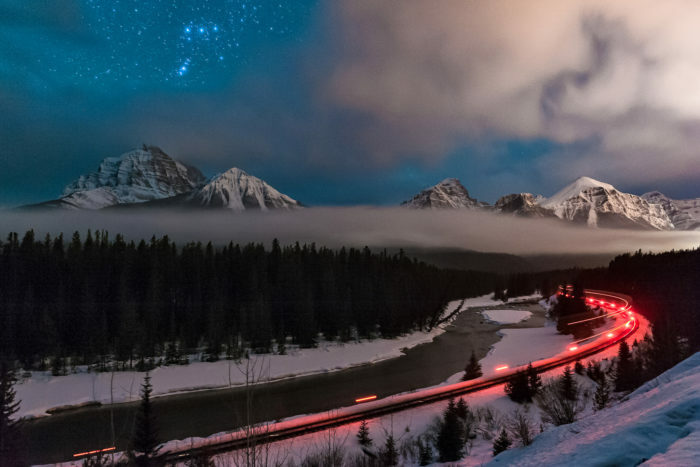 First place goes to Nick D’Amato of Denver, Colorado, for his starlit photograph of an eastbound Canadian Pacific freight passing famous Morant’s Curve near Lake Louise, Alberta. CP company photographer Nicholas Morant made this spot famous with his views in the 1950s. Six decades later, D’Amato came up a fresh interpretation of this well-known location. Low-hanging clouds with a clear patch of star filled sky add depth and mood to the cold, snow-filled scene. The smoothness of the passing clouds is a contrast to the sharp mountains, and the red glow of the EOT device adds visual warmth to a chilling winter image. D’Amato used a Nikon D700 set to ISO 3200. He held the shutter open for 25 seconds with the aperture of his 24-70mm lens at f2.8. A Norfolk Southern freight train navigates downtown Columbus, Ohio, as hockey fans depart Nationwide Arena after a game on September 9, 2016. Second place goes to Brandon Townley, Sunbury, Ohio, who pictured a Norfolk Southern train passing beneath a street with crowds of hockey fans leaving Nationwide Arena following a hockey game. This visually-complex image captures a slice of life at night with excellent color and clarity, something impossible with traditional films. Townley used a Canon 6D digital camera and 17-40mm lens with settings of 17mm, ISO 6400, 1/13th of a second, and f4.0. At the the world’s last major industrial steam operation, the opencast coal mine at Sandaoling, China, JS-class 2-8-2 locomotive no. 8081 puts on a spectacular display of sparks as it thunders out of the mine with another load of coal on February 16, 2017. 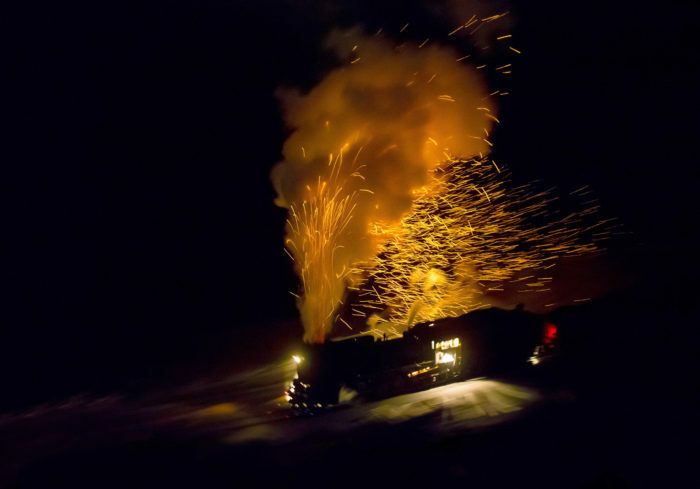 Third place goes to Darryl Bond, who lives in Waimate, New Zealand, for his nighttime view of what could be titled “Chinese Fireworks.” A JS-class 2-8-2 steam locomotive is trailed by an explosion of embers as it thunders out of the opencast coal mine at Sandaoling, Xinjiang, China. Light from the firebox also illuminates the scene, with the pan effect and the sparks providing a distinct, impressionistic feel. 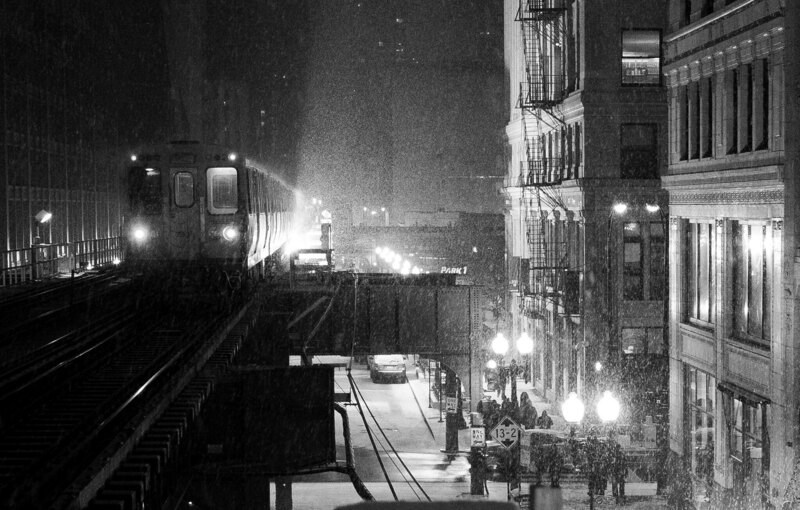 During an evening snow storm in Chicago, the pickup shoes of an L train arc into the night, momentarily lighting the dark building canyon facades. Read more about the 2017 John E. Gruber Creative Photography Awards Program. Chicago suburbs and two passing trains appear as blurred streaks of light in this thirty-second exposure from the rear of the "Caritas" observation car during Metra's evening rush hour as the eastbound California Zephyr nears its final destination on November 10, 2014. Read more about the 2017 John E. Gruber Creative Photography Awards Program. In New York City’s closed City Hall station on March 4, 2017, a crowd on the left is taking pictures of subway riders. Photographer Dennis Livesey used a full-frame camera with an 8-15mm fisheye lens set at 9mm. Processing of the image included digital straightening of the circular image. Read more about the 2017 John E. Gruber Creative Photography Awards Program. 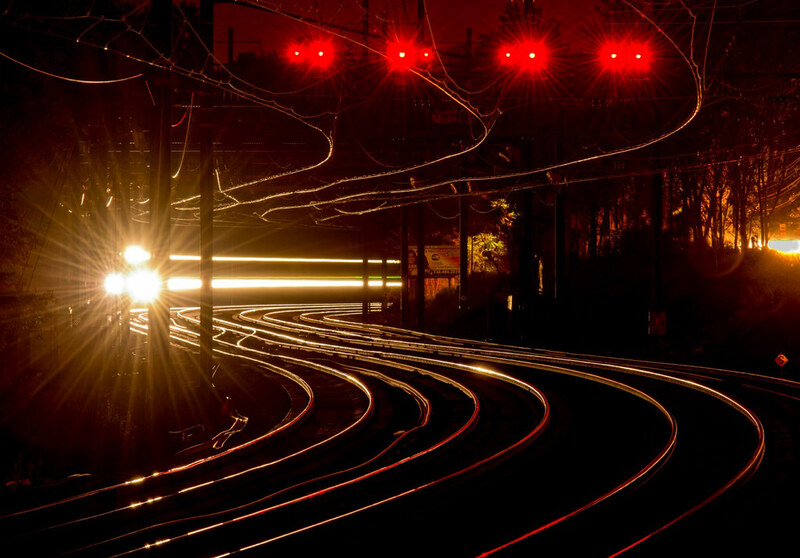 The headlights of northbound Amtrak Northeast Regional train shine along the Northeast Corridor at Metropark, New Jersey, on the night of September 19, 2014. Read more about the 2017 John E. Gruber Creative Photography Awards Program. 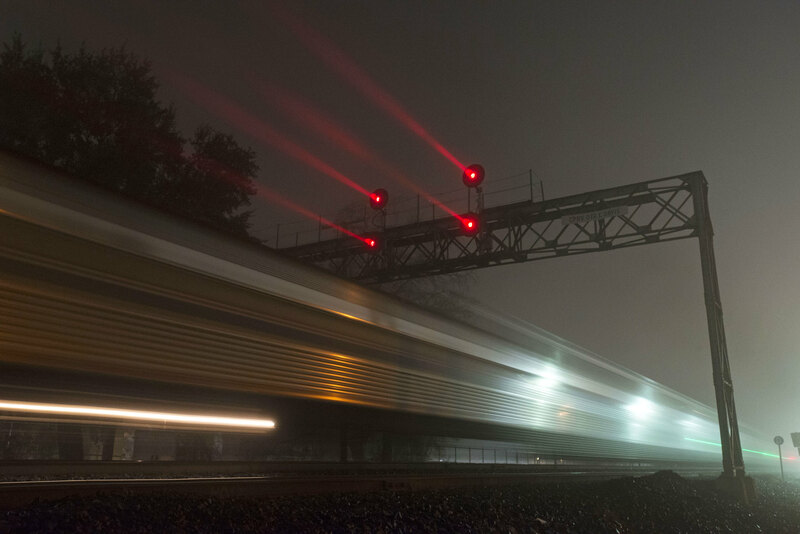 Norfolk Southern freight train 15T has taken the siding at Shenandoah Junction, West Virginia, and its end-of-train device flashes into the night of September 27, 2014. 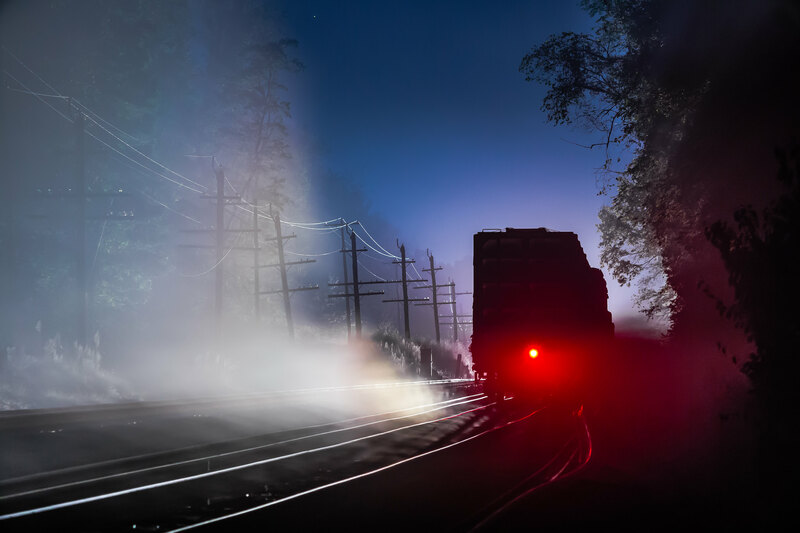 On the adjacent track, intermodal train 214 resumes its trek north, illuminating the right-of-way with its headlights through the drifting midnight fog. Read more about the 2017 John E. Gruber Creative Photography Awards Program. Providence & Worcester train NR2 rolls south through Ledyard, Connecticut, in a shroud of diesel exhaust from the lead locomotives, which have just left the frame. Read more about the 2017 John E. Gruber Creative Photography Awards Program. 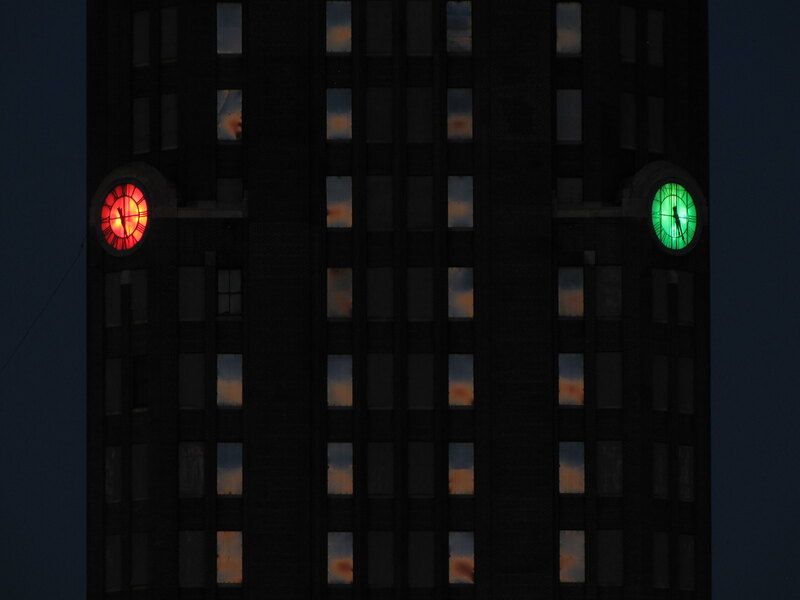 Buffalo Central Terminal's clocks glow red and green for the holidays as the last light of New Year's Day 2017 reflects off the windows. Read more about the 2017 John E. Gruber Creative Photography Awards Program. Amtrak passenger train no. 14, the northbound Coast Starlight, passes under a searchlight signal bridge as it departs Davis, California, on the night of February 18, 2015. Read more about the 2017 John E. Gruber Creative Photography Awards Program.